Vote for Matt’s Cybernetic Arm! A pretty awesome tattoo, right? But the post doesn’t end there! Along with the tattoo pic, I got an email from Matt that says “I’m gonna pull a dirty trick here and even paraphrase Razor and Blade from Hackers saying that I need more than a media icon such as yourself, I need an army, a digital army. Geek/gamers of the world unite!” Why does he need your support? No, there’s no oil tanker with a virus that’s about to kill a bajillion whales (they’re all safe thanks to the Sea Shepherd). Well Matt’s geeky ink is entered in a tattoo contest for a local Philadelphia radio station, Radio 104.5. So kind readers of Geeky Tattoos, Hack the Planet! errr Vote For Matt’s Tattoo! It’s easy and doesn’t involve any roller blades or even using dirty payphones. Ha, like you could even find a payphone anymore. Need some incentive other than the warm feeling of helping a fellow geek out? One lucky random person that votes will win $500. That could pay for a really sweet tattoo. Oh and you can vote every 24 hours. Disclaimer: Yes, if your geeky tattoo is a) awesome, b) in a contest, and c) you ask nicely and offer to buy me a beer when I’m in your town I’ll totally post a call for votes for you. Posted in Anime & Manga, Books, Computers, Star Wars, Tattoos. Tagged with arm, Björk, Douglas J, Ghost in the Shell, High Rollers Tattoo Studio, Knights of the Old Republic, Mass Effect, Mat Kerfen, sleeve, The Force Unleashed, William Gibson. Thank you so much. This is more than I could have ever hoped. I really appreciate it and I definitely owe you that beer (or five). All i can say is wow, i love the art work and the concept is a real winner. if i could vote a million times i would. This is pretty sick. what made you chose your shoulder instead of the elbow? isnt his omni tool on the forearm? I wasn't going to quite so literal of a Mass Effect translation as that, although the more I get used to it, the more I can see the influences of Shepard's armor in the work. I've kinda always just had some strange affinity for the shoulder/arm armor thing. It just makes me feel a bit like a superhero, I guess. So, I just wanted to post an update. Sadly, I did not win the tattoo contest. But, life goes on. I did want to say thank you to Ed in particular and offer my gratitude and appreciation (and beers, can't forget the beers) to everyone who voted for me and shared/reblog/retweeted/ or whatever else to help spread the word. Ultimately, the goal was to get recognition for the very talented artists that contributed to this wonderful piece of art and I do believe that was accomplised. Thank you to everyone. This sleeve is epic… WOW!!!! This is a great tattoo, excellent even, however, was the vote to keep this as the last tattoo posted on this website? I realize this has nothing to do with it, but this tattoo reminds me of Robocop. But it is seriously one of my favourite tattoos, other than my own, of course. Great job with the design, and execution. And kudos to the artist . Awesome work, all around. one of the top 5 tattoos I’ve ever seen. amazing work and amazing taste, matt!!! 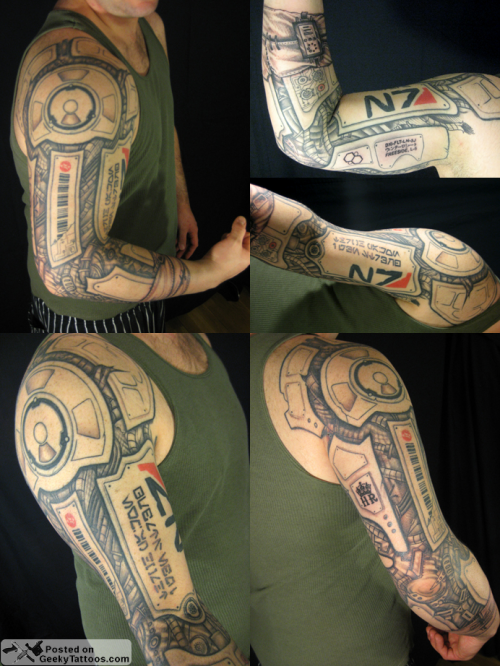 That is one badass cybernetic tattoo, dude. I absolutely love it!